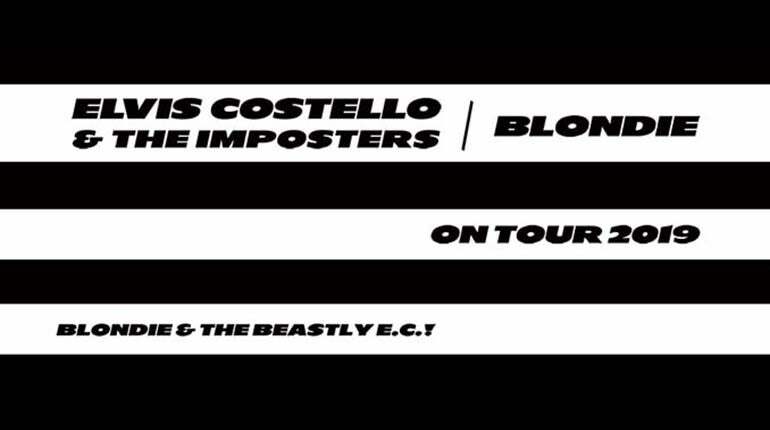 Elvis Costello & The Imposters and Blondie will co-headline a coast-to-coast tour this summer. Produced by Live Nation, the 13-city tour will kick off July 20th in Bethel, NY at the Bethel Woods Center for the Arts and make stops in Boston, Las Vegas, Los Angeles and more, before wrapping August 10th in Seattle, WA. In 2017, Blondie hit the road in support of their most collaborative album yet, Pollinator (BMG). Their spectacular live shows drew acclaim for their “flair and precision” (Rolling Stone), while being called “formidable” (LA Weekly) and “artful, rocking” (City Pages). Pollinator was praised by the likes of New York Times, Rolling Stone, NPR, Entertainment Weekly, Pitchfork and many more for its dynamic blend of Blondie's trailblazing sound and new influences from some of modern music's greatest innovators including Sia, Dev Hynes, Charli XCX, Dave Sitek, Joan Jett, and more. It features the euphoric disco-infused single "Fun," the propulsive 80s-esque anthem "Long Time," and the irreverent "Doom or Destiny." Elvis Costello's wide-ranging recording career began in 1977 with the release of My Aim Is True in a catalogue that include such diverse highlights as This Year's Model, Get Happy, Imperial Bedroom, King Of America, Blood & Chocolate, The Juliet Letters with the Brodsky Quartet, The River In Reverse with Allen Toussaint and Wise Up Ghost with The Roots. The 1998 release, Painted From Memory contained the first of more than thirty songs composed with Burt Bacharach, while the 2017 box-set re-issue of Paul McCartney's Flowers In The Dirt includes 15 demo duet recordings made by McCartney and Costello prior to the release of the albums Spike and Flowers In The Dirt, on which his co-written hit singles, "Veronica" and "My Brave Face," were first released. Elvis Costello & The Imposters’ widely renowned Look Now was released by Concord Records in 2018 and of which Variety said, "It's so funny to be seeing him, after all this time, making a great cake of an album that doesn't really sound that much like any of the 30 before it." The catalogue will soon include the E.P., Purse, containing songwriting collaborations with Burt Bacharach and Paul McCartney and musical settings of lyrics by Johnny Cash and Bob Dylan. Since the release of their self-titled debut album in 1976, Blondie has brought the worlds of rock, punk, disco and ska together and racked up four indelible Billboard Hot 100 #1 hits - “Heart of Glass,” “Call Me,” “The Tide Is High” and “Rapture ” - as well as six #1s on the UK Singles Chart including “Maria,” “Sunday Girl,” and “Atomic.” Debbie Harry – genre-spanning visionary, complex songstress, incandescent front woman and style icon - and the band's boundary-pushing pop have shaped the look and sound of many chart-topping female artists who have followed and have made Blondie widely recognized as one of the most influential bands of our time. Debbie will reflect on this and more in her highly anticipated memoir out later this year. Blondie’s Chris Stein recently released a photo book of his own entitled Point of View: Me, New York City, and The Punk Scene, following his successful first photo book, Negative: Me, Blondie, and the Advent of Punk. Selected as one of Amazon’s best photo books of 2018, Point of View showcases Chris’ brilliance as a photographer and documentarian, chronicling his life among his punk and new-wave peers and the downtown New York City scene in the 1970s through his insider lens.